A stream of cyclists, decked out in colorful, skintight biking gear, rides together every Tuesday morning. A leisurely ride, it’s less about endurance than it is about having fun. With nicknames like “Captain Bob” and “Too-Tall,” the group can be seen out cycling the Longview Loop or other bike paths around South Kansas City. 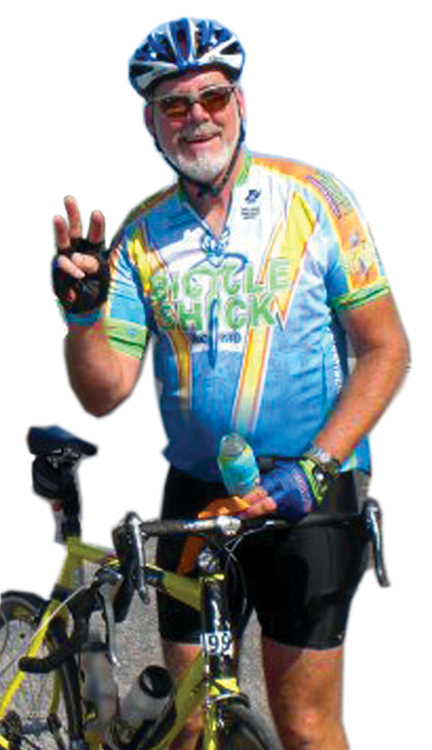 But last Saturday, their ride was much different– a funeral procession of cyclists riding to honor the man who brought them together in the first place: Chris Smedley, owner of the Bicycle Shack on Blue Ridge Blvd. in South KC. Smedley passed away April 29 after a battle with pancreatic cancer – one he handled with the positive attitude that characterized his life. He was just 51 years old. Born in Kansas City in 1961, Smedley was raised in South KC and Grandview, where he graduated from GHS in 1979. He was buried May 5 at Mt. Moriah Cemetery, after a funeral that was characterized by a sense of celebration, rather than grief. Few black suits were in evidence at the service – instead, many of his friends and family showed up in their cycling gear. Though cycling was Smedley’s lifelong passion and occupation – his dad owned a bike shop, and Smedley opened his own in 1981 – his friends say it was about something deeper than mere athleticism. Cycling was one of many ways that Smedley brought people together – people who became close friends, all of whom have stories to share about how loving and kind he was. “There aren’t enough superlatives or accolades to describe how great of a man Chris was, but one of the things I admired most about him was how selfless he was,” said Ben Simon. Bolton soon joined Smedley’s regular Tuesday morning rides and got to know the man. “He taught me a lot about cycling, and a lot about life,” Bolton said. More than 20 friends gathered at Neighborhood Café in Lee’s Summit on May 4 to honor Smedley. The breakfast was a continuation of a Friday-morning tradition Smedley started a few years ago, rotating between various local eateries. Throughout his battle with cancer, “ChrisStrong - Keep Rollin’” bracelets were made to increase public awareness of those battling cancer in the Kansas City area and beyond. It was indicative of the man, and the love he had for his friends, family and community. In fact, Smedley’s biggest legacy, Bolton said, has less to do with cycling and more to do with friendship and love. Jason Starforth, Smedley’s son, agreed. With cyclists of all skill levels involved in Smedleys’ rides, he’d never let anyone fall behind. Several friends shared variations on that story – being stuck at the back of the group, struggling with a hill, feeling frustrated, only to look up and see Smedley’s smiling face. “He always took care of new people, and made sure they didn’t get left behind,” said Donna Swift. Jim Flath agreed, recalling that when he first started riding, he struggled more than once. Bert Swift, who works at the Bicycle Shack, said the business was more than just a job for Smedley – his vocation and his avocation were the same thing. One aspect of Smedley’s life surfaces over and over in conversations with his friends – how nice he was. But Starforth said Smedley never would have thought of himself that way. John Tye said Smedley went above and beyond the normal commitments of a small business owner. Brian Lasswell, a competitive cyclist, said Smedley’s regular business hours were flexible when it came to racers. “Being on a race team, if you had a race the next day and needed work done on your bike, he didn’t even think twice about keeping his shop open late,” Lasswell said. Smedley, whose shop sponsors racing teams, would even do that for cyclists who were competing against him. Though Starforth and his sister, Elizabeth, are technically Smedley’s stepchildren, he was always “Dad” to them. Starforth remembers the first time he ever met Smedley, and said his patience and kindness were evident. But when Smedley came out and saw the stack of rocks on his car, he didn’t get angry or annoyed. “He just laughed and said, ‘What have I gotten myself into?’” Starforth recalled.